It’s that week of the year! Companies have been announcing their special deals for Black Friday all week. T-Mobile’s Black Friday deals have now gone live and apply all week long, and they include some of the hottest phones on the market. Hit the Black Friday/Cyber Monday deals page on T-Mobile.com to see all the deals, or just hit the links in each individual offer listed above, they’ll take you straight to the product. So the Black Friday discount is not really a discount except that your down-payment is just lower than normal. Your net cost of these phones appears to be the same full retail price. So for the G2… instead of $100 + $21.84 x 24 they have $0 + $25 x 24 = $600. Am I wrong on the math? If you do the match there’s a discount. If you do the math, you are saving $24.16. Just buy it straight from Google. Its Cheaper at $349. That has been what holds me back as well. Every time I buy an unlocked phone that’s not registered on T-mobile’s databases I get a letter saying that they don’t cover my device. All for new accounts, right? Why don’t they drop the price on older phones? You can get a new LG G2 from Swappa and Ebay for under $500 easily. And last week, Newegg’s eBay store had a brand new Galaxy Note III (international version) for $599. Even those it is older phone,I got almost brand new Amaze on Ebay,for $136.00 with shipping. I buy most of my tech on Ebay. Pretty mediocre discounts. Not compelling for those of us who are willing to pay full price for phones. Getting something slightly used on eBay or Craigslist still makes for the best deal. Somewhat disappointed. So this is just another round of $0 up front, higher monthly payments “sale”? No actual $$$ discount being given? (Looking at the G2) Isn’t this the exact same deal they had for all of last month? Pretty crappy…Thats not an UNcarrier…The other carriers are having better promotions that get people excited. Guess TMobile hopes people aren’t really good at math. So, still no deals for existing customers? These are existing/new customer promos. As long as you are upgrade eligible you can take advantage of these deals. I guess they just need to add a box where existing customers can enter a promo code when they upgrade on the website. What a joke! I’m a die-hard Apple user and been with T-Mobile for over 10 years now. T-Mobile finally gets the iPhone this year but I don’t see any discounts for the iPhone or iPad. Yikes!! What’s up with T-mobile Grinch for the holidays? Or maybe the prices are set by Apple. Sprint and ATT have been taking $100 off the iPhone on contract. Tmobile can get creative if it wants to create real attention. Im surprised they havent done more to get people to give them a second look. You’re a diehard Apple user, yet you don’t know how Apple operates? Anyway, if you were paying attention a few months ago, you’d realize that the iPhone 5S and 5C are already being sold at a reduced down payment. There’s a difference between lowering the full price and lowering the contract price. Apple doesn’t want to be undercut this holiday. Reducing the down payment is not a discount in my eyes. Lowering the price of the phone from $649 to $599 is a discount to the device and T-Mobile is just too cheap to lower the price of the device by even $50. Instead, they are throwing in useless accessories instead. As I said, you don’t know how Apple works. They have to approve discounts, and they generally won’t allow discounts on the full price this early on because it undercuts them. I used to be upset until I thought about it and realized that no-one is really going to keep their phones long enough to actually pay the full price of the phone. There should be an full upfront price discount though for those that want to pay the upfront cost though. The point is they are lending you more money interest free. Less out of pocket up front. It’s still a good deal if you don’t want to pay full price up front compared to say your credit card interest rate. Another Black Friday Promotion – $0 Down on Samsung Galaxy S4. Samsung Galaxy Note II and Samsung Galaxy Note III from Friday – Sunday at T-Mobile stores. This is attractive, however, if all they are doing is changing the amount of the EIP and not the amount of the actual devices and adjusting the EIP accordingly, then its really just a personal preference. Pay more up front and less monthly or visa versa. I don’t see any discount in the phone by paying less upfront. Your’e still paying full retail for the device. Is Tmobile doing 0 down but adjusting the monthly payments again? Looking at some other carriers and 3rd party retailers, there are some good deals out there by the un-uncarriers. 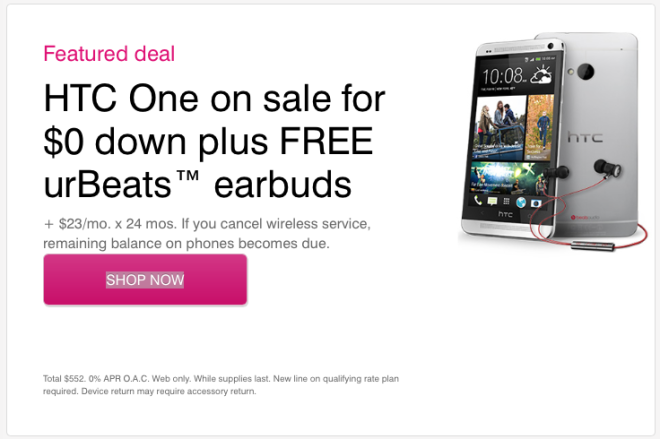 At least T-Mobile finally offers a discount on the full price of the device. Oh well, I paid a $48 premium to have the device almost two months early. Does Tmobile offer a price guarantee? “zero down! note: [in tiny little font] your total equipment cost over the life of 2 years remain the same…” LOL, thanks but no thanks. Forget this and wait for the big deals Black Friday and Holiday on the phones that you really want. These are Tmobiles black friday deals. Sorry should have been clear – meant when Black Friday actually comes, there will be additional deals and on phones you don’t see here that you might be looking for. or are they lock to Metro. Thank you. I used this deal to buy a Note 3 for my husband. There is a $48 discount off the total price of the phone. T-Mobile is not shifting the cost this time. Are these deals only available online, or are they also available in retail stores? This is an online-only deal. I called a local store and they said they know what the black friday promotion is but they can’t announce it just yet. So I’ll wait! Yes, you are correct. Just wait. This can only be applied to new phone purchases/add lines – although no where in the web-site mentions it (SERIOUSLY NO WHERE). I talked with local stores, web representatives, customer care and finally tele-sales via customer care (whoever that is). I’ve been waiting for Black Friday deals, finally got it but can’t apply to so called an Upgrade option (BTW it’s not even an upgrade since the phones were brought in from outside). Have I knew that existing lines/customers would be discriminated from the deals, I would have bought the phones three weeks ago and call it good deals. I let my family stick with barely functioning phones just for the sake of getting some deals, and now I wasted all this time and energy (which is worth way more than the discount itself). I myself switched from Verizon to T-Mobile three weeks ago, but now that I’m frustrated with T-Mobile customer care, I’m considering switching back to Verizon or other carriers. Usual TMO bait and switch. No deals here. They reduce the down payment and raise the monthly payments.